Please note: there are more graphics and numbers in this post than I usually get into on this blog. But hang in there… this is important for our dogs… and for us! There hasn’t been a whole lot of *new* in veterinary medicine in northeast Ohio over the past couple of decades as it relates to parasites and diseases. Canine Influenza has been regional around the United States. Certainly at-risk dogs ought be protected, but this disease hasn’t yet had a full-on outbreak in northeast Ohio. About 8 or so years ago there was fear that Virulent Strain Calicivirus would become a widespread problem among cats, but this has not come to pass. The last big new disease came in the late ’70s and early ’80s as Parvovirus hit with a bang and took a major toll on dogs all over the country. Since then, though, there hasn’t been anything both new and widespread in this area of the state. We’ve mostly been controlling the same parasites and preventing the same contagious diseases for a generation. But there has been a slow and steady development around here over the past couple of years. We’ve seen it creeping up, and it is something that dog owners must now be aware of. While ticks weren’t much of a problem in northeast Ohio five or so years ago, they’ve been migrating west across Pennsylvania, and they are absolutely here now. The great concern is that these ticks can carry diseases. Lyme, Ehrlichiosis and Anaplasmosis are the three major diseases that ticks can give to dogs… and people. 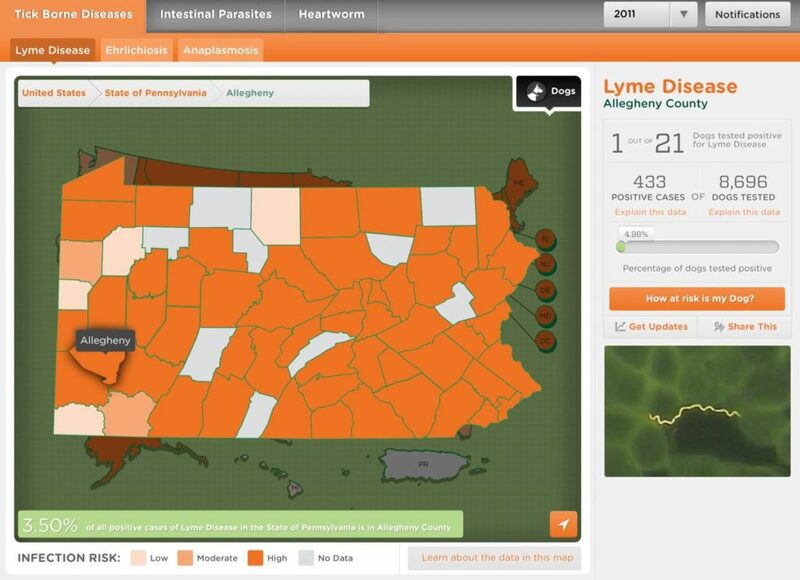 Allegheny County has had nearly 4 times the number of Lyme disease positives in 2016 compared with 2011… in less than half the months. Yikes. Did you notice the eastern-most Ohio counties in 2016 compared with 2011? Definitely more orange. And did you notice those Summit County numbers? Two positive Lyme disease dogs in 2011 and 35 so far in 2016. And we’re testing more than 10-times the number of dogs in less than half the time. This is no small thing. And note the ratio. 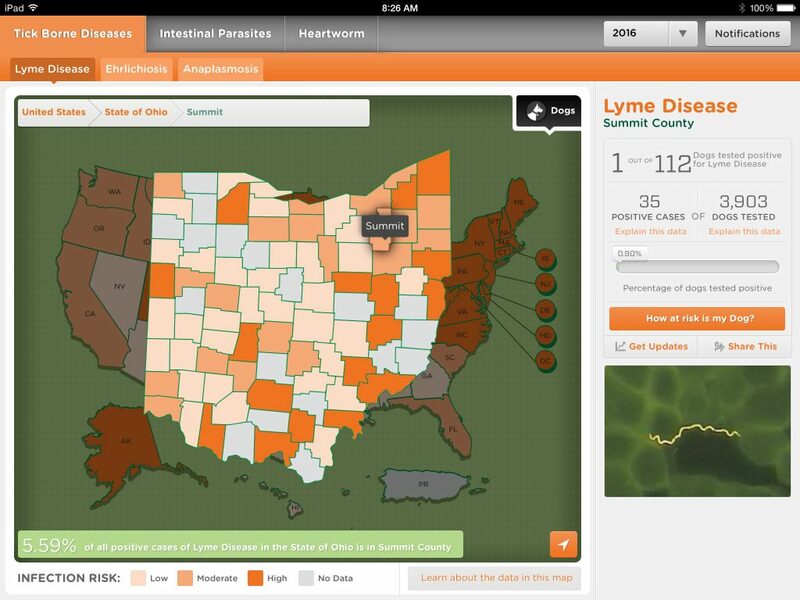 The CAPC reports 1 out of 112 dogs in Summit County have tested positive for Lyme. As of this writing, we’re seeing a rate of 1 out of 84 here at Cuyahoga Falls Veterinary Clinic this year. 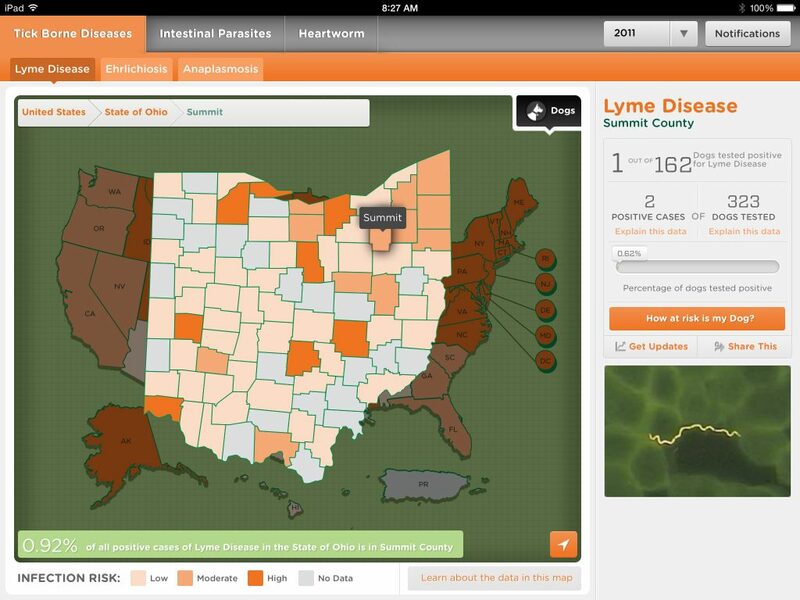 The take-home message: Ticks have been on the rise in northeast Ohio over the past few years. This increase has followed particularly hard winters. 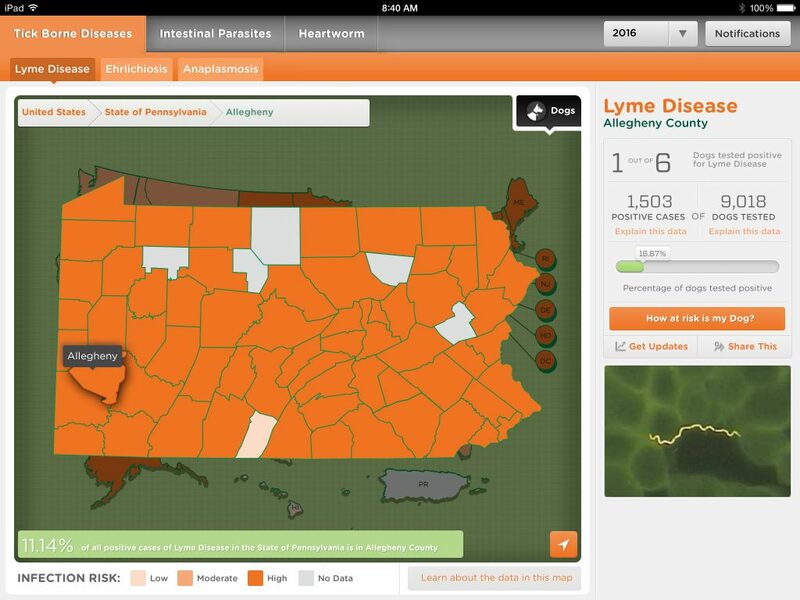 But this past winter wasn’t so harsh… who knows how many more ticks we’ll see this year? They have officially taken up residence in northeast Ohio. We are currently surveying all of our canine patients, testing them for Lyme disease at the time of their annual heartworm blood test. Control of the parasites and prevention of the disease is important at this stage, and we have good, effective, safe tools to both control ticks and prevent Lyme disease. Think your dog may be at risk? The reality is dogs are more at risk than you may believe. Don’t hesitate to speak with one of our doctors about both tick control and Lyme disease prevention.